Some three years on from 2014’s Perfection & Permanence (reviewed here), Thomas Ekelund has returned with the follow up full length Kainskult, issued via the cult industrial label Tesco Organisation. Sonically speaking this new album demonstrates the further honing and refinement of the evolved rhythmic song-based approach, where everything about Kainskult feels as it has been stepped up a notch: from the song writing; to vocal delivery; to recording; and finally to the production. 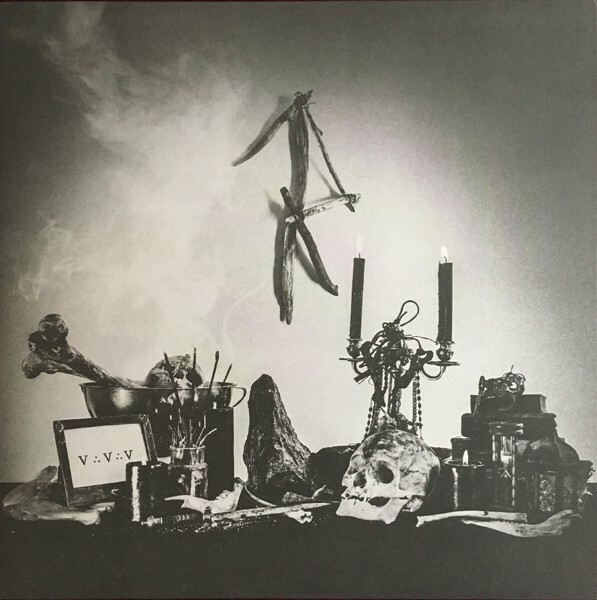 Yet with reference to the production, it is far from being clean and polished as it maintains harshness and grit befitting of its chosen ritual death industrial style, so is more a case that all elements have been elevated in sonic intensity. The methods of recording also illustrates the use of programmed elements blended with real instrumentation such a s standing drum kit (floor tom and cymbals), junk metal type percussion, distant ceremonial horns and other ritual percussion, while the vocals are on occasion multi-tracked, or presented as a backing chorus. With a distant gruff voice proclaiming “Fratricide! Fratricide! Fratricide!”, Death & Ecstasy opens the album which is a vocal led number set to a minimalist rhythmic thump and with the semi chanted vocals comes across as a mantra of sorts. With this relative slow burner as the album opener, it only functions to amplify the impact of Maðr Malformed which is heavily driving piece based around rolling militant percussion, swaying bass rhythm and gruff vocals following a perhaps now trademark verse/ chorus/ verse format. All Flesh Has Corrupted is also noteworthy for the lyrical approach where the multi-tracked vocals are rhythmically delivered to follow the bass and ritual drumming. One of the longest tracks of the album (at 7 minutes) isᚲ ∴ ᚲ ∴ ᚲ which sits towards a soundscape styled offering, although bass and slow pounding drums provides a ritualized framework, while the following pairing of Feral Me and Serpent Seed demonstrates the album in its strongest song-based format. Feral Me features some fantastic roiling metallic percussive elements, while Serpent Seed is by far the album standout, with its monolithic pounding bass, counterpointed clanging metallic beat, and gruff multi tracked vocals which again demonstrates Thomas’s skill in executing vocal delivery which perfectly melds within the tracks percussive and rhythmic structure. An Immaculate Body Of Water is another 7 minute track, and while it is effectively double the length of the majority of tracks, it does not feel as long as this even with its slow pacing, where grinding drones, slow bass thuds and garbled vocals are the order of proceedings. With a blink and miss it length of ∴ at 29 seconds, the album concludes with V ∴ V ∴ V, being one final song based percussive rhythmic based track, again with thick bass drones and militant rolling beats. Thematically speaking, the title of the album clearly alludes to the continuation of an esoteric and symbolic exploration of the Cain and Abel mythology, which is also reflected strongly in both in lyrics and visuals. It would then seem there is further meaning embedded in the cover artwork, yet I have yet been able to decipher the clues within select lyrical symbolism and typographic design to determine what the hidden message may be. But aside from such conundrums, this review has been written some months after the original release in October, 2017, where it was then observed that the first edition issued in 250 copies each of black and white vinyl pressing sold out at lightening speed, and has since been repressed in a red vinyl edition (500 copies). Based on those sales this obviously evidences that Kainskult has been a very popular album, but perhaps it is also indicative of interest being shown outside of the core underground post-industrial scene. This can then be explained by the fact that Trepaneringsritualen have toured extensively as a support act with a number of underground black metal bands, which is likely to have fostered a diversification of a typical audience for this sort of material. Likewise, given the occult and esoteric thematic focus and the strong rhythmic song based approach, it is easy to appreciate why black metal listeners would find a certain affinity with Kainkult. But regardless of where the current audience interest in Trepaneringsritualen is coming from, this is ultimately irrelevant to the fact that Kainkult functions as an expertly crafted, stormer of an album. This entry was posted in 2017, death industrial, industrial, ritual, Tesco Organisation by noisereceptor. Bookmark the permalink.